Azerbaijan votes on Sunday for its third parliament since independence, following clashes between police and the opposition. The New York-based watchdog Human Rights Watch says the police action amounted to a "campaign of violence and intimidation" undermining the election. The election is seen as a test of Azerbaijan's claims to be making progress towards greater democracy. Visiting US and other western diplomats have made it plain they expect Baku to show commitment to free elections. Exiled opposition leader Rasul Guliyev raised the stakes when he made an unsuccessful bid to return to Baku in October. The authorities accuse him of embezzling public money in the 1990s. He was taken into custody in Ukraine en route for Baku under an international arrest warrant, but later released. Two ministers and some 30 other officials were arrested on charges of plotting a coup with Mr Guliyev, who says the allegations are "absurd lies". He is still a registered candidate. Q: What is the system? The constitution provides for a division of powers between a strong presidency and parliament (Milli Maclis), which approves the budget and can impeach the president. Since previous parliaments were dominated by the president's party, they have been seen by many as little more than a rubber stamp. After constitutional amendments adopted in 2002, all 125 deputies are now elected on a first-past-the-post basis. The 2000 parliamentary election was widely considered to have fallen short of standards set by the Council of Europe that year as a condition for Azerbaijan's membership. Human Rights Watch reported intimidation or bureaucratic obstacles used to stop candidates registering on time. Polling day was marred by allegations of vote-rigging. 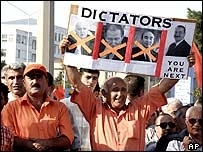 The election of President Ilham Aliyev in October 2003 met with similar criticism. Tampering with ballot boxes and results lists, as well as the arrest of over 700 people following post-election violence, were reported. Opposition groups are among some 50 registered parties. Parliament has lifted a ban on foreign-funded NGOs monitoring the election. The president has ordered the inking of voter's fingertips, to prevent multiple voting. A new law provides for multi-party election commissions. The media has reflected a diversity of political views and legal provisions for free airtime have been respected. More than 1,500 candidates are competing for the 125 seats, many of them independents, according to official figures. The official election website showed the ruling New Azerbaijan Party (NAP) with 431 candidates, competing against three main opposition blocs: Azadliq (Freedom) with 116 candidates, Yenu Siyasat or YeS (New Policy) with 69 candidates and the Liberal Party of Azerbaijan with 68. Q: What does the ruling party stand for? It says the president's father and predecessor, Heydar Aliyev, saved the country from the turmoil that followed the collapse of the Soviet Union. The NAP says the economy is developing rapidly and that it has created hundreds of thousands of new jobs. And, in common with other parties, it pledges to "liberate" lands occupied by Armenia after the war over the disputed territory of Nagorno-Karabakh. Its key candidates are: Mehriban Aliyeva (wife of President Ilham Aliyev), Ali Ahmadov (party executive secretary), Siyavus Novruzov (deputy secretary) and Murtuz Alasgarov (parliament speaker). President Aliyev is party chairman. Q: What does the opposition want? Inspired by the popular "velvet revolutions" in Georgia, Ukraine and Kyrgyzstan, the opposition is united in its call for more democracy. Formed in July 2005 from three parties, Azadliq is considered most radical, but denies it is bent on revolution. Its leaders are Rasul Guliyev (Democratic Party of Azerbaijan), Isa Qambar (Musavat Party) and Ali Karimli (People's Front of Azerbaijan). Mr Guliyev, an ex-parliament Speaker, had his candidacy rejected for the 2003 presidential election. Isa Qambar stood and came second. YeS was founded in April 2005. It espouses a "peaceful transition" to democracy. Its leaders include Etibar Mammadov, who stood for president in 2003. The Liberal Party of Azerbaijan (LPA) was founded in 1995, with national unity its main slogan. LPA leader Lala Sovkat Haciyeva came third in 2003. According to the pro-government Ray (Opinion) centre, 59.1% of respondents said they would vote for the ruling New Azerbaijan Party. But the independent ADAM (Man) centre gave Azadliq 31.2%, followed by the New Azerbaijan Party with 22.7%, then YeS with 6.3% and the Liberal Party with 2.5%.